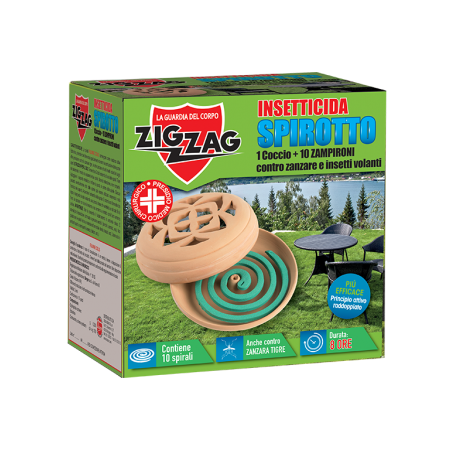 Kit consists of a pack of 10 pieces of spirals insectifuge spirotto + two metal supports and practical, stylish clay made of terracotta . Delicately separate the spirals contained in the packet. Fit the round end of one spiral onto the provided metal support. Light the opposite end with a match or cigarette lighter. Check after a few minutes that the flame is out (if it is not, blow on it); a little smoking glowing tip should remain for slow and gradual combustion. If you want to extinguish the spiral before it is exhausted, simply break it and light it on when you need it again. In the open or in semi-open well-ventilated places. In closed spaces. Places used by sensitive people (small children, asthmatics, ...). In contact with fabrics, paper and combustible materials in general. The product acts by contact, respiration and ingestion.